Building a powerboat from a kit isn’t a project for everyone, but it can be a great way to go. You might take on the task because no production builder offers the exact boat you’re looking for. Perhaps you have lots of time on your hands, or you want to own a boat that’s bigger than you could afford if you bought a finished one from a reputable manufacturer. Plus, if you’re good with your hands, this may present an excellent opportunity to relive your high school days and have some revenge on the geeks studying precalculus while you were turning baseball bats on the wood lathe in shop class. Naturally, taking on such a project requires a basic familiarity with construction materials and methods, as well as an adequate inventory of specialized tools. In addition to a certain level of knowledge and aptitude, you also have to have a generous amount of resilience and tenacity — like the fellow we featured in the June issue who built the 55-foot steel trawler from scratch. Now that is the sort of mindset you need to succeed in building your own boat from a kit. Although there are companies that sell patterns for building the boat from the ground up, cutting out the keel and frames to erect on a strongback to build the hull, such a project takes a lot of time and is not necessarily a great idea for many do-it-yourselfers. A more practical approach is to buy a bare fiberglass hull and deck, then build the rest of the boat from there. Many of the kit boats on the market are built in Maine, so they have Down East-style hulls with round bilges and full keels. 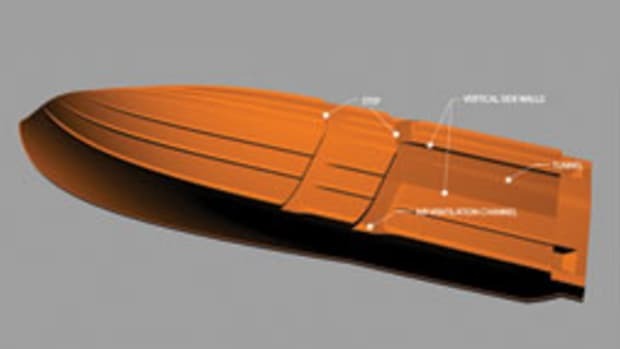 These semidisplacement hulls can be pushed to full planing speeds with enough horsepower, but if you want an efficiently propelled 25- or 30-knot cruise boat you might consider looking at a hard-chine planing hull without a keel because of its reduced resistance and added efficiency while on plane. On the other hand, round-bilge hulls offer very comfortable motions in a seaway, although they can be wet. They work very well in their intended 12- to 22-knot operating range, so my recommendation is to power them accordingly and resist the urge to turn them into speedboats. 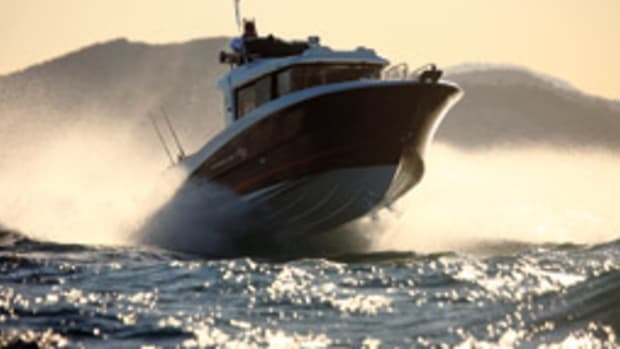 Single-diesel power is the way to go on anything bigger than 32 feet or so, with the engine installed deep in the built-down hulls many of these boats feature. That said, some of the 24- to 30-footers would do quite well with the new 4-stroke outboards. Just be sure to have the hollow keel eliminated (blocked off when laying up the hull) so the boat will heel into a turn. Doing so also will reduce drag and increase efficiency. The simplest kit is a bare fiberglass hull with bulkheads and stringers installed to keep the hull’s shape. 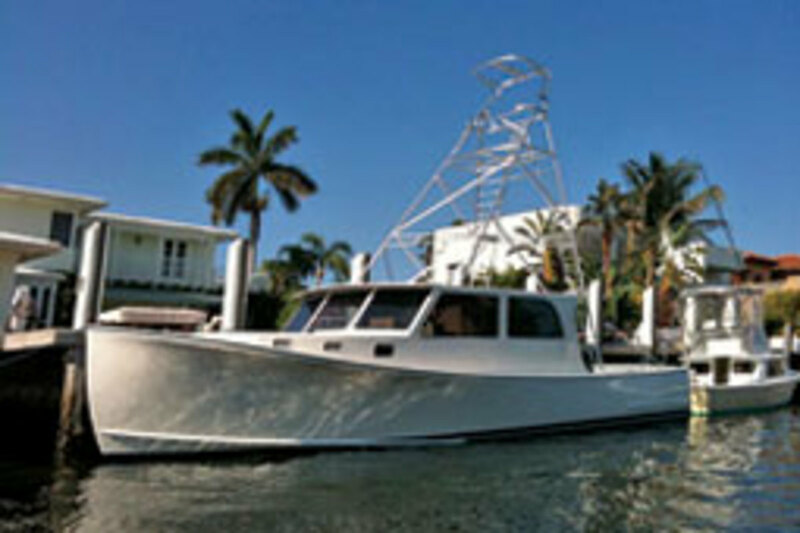 The premise is that you start off with a soundly built hull of a design that has proven itself in previous applications. 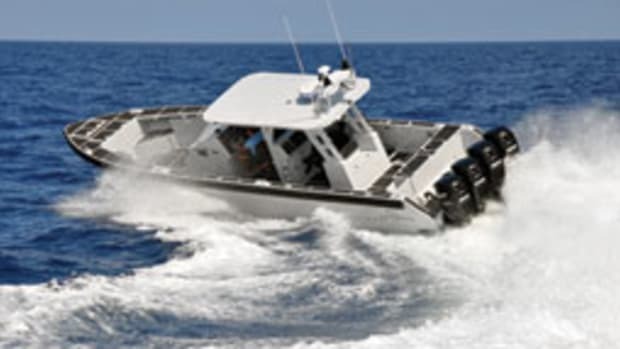 Of course, as with boats built and sold ready-to-use through dealers, there is a wide range of design and construction merit to be found in various kit boats. Some kit builders will let you specify the hull construction, within limits. If you want bare-bones, the simplest, cheapest and easiest boat to build starts with a solid fiberglass hull — no balsa or foam coring — plywood bulkheads and wood-core stringers, often made of fir 2-by-8s or 2-by-10s encapsulated in fiberglass. Simple and cheap means heavier rather than lighter, so you might specify a balsa- or foam-cored hull to take some weight out of it. Less fiberglass is needed with two thin skins rather than one thick one. However, I would avoid putting balsa core in the bottom because the damage that would result from water getting into the core likely would be disastrous. The type of resin used also affects the cost of the hull. A simple polyester orthophthalic resin can produce a long-lasting, blister-free boat if the glass against the gelcoat is completely wetted out and properly cured. The next step up is an isophthalic resin, which has slightly better physical properties. Next is vinylester resin, which is stronger still, with higher elongation and better adhesion, and it’s more impervious to blistering. There are blends of polyester and vinylester that improve the resin’s physical properties in proportion to the amount of vinylester used. You also can specify a skin coat wetted out in vinylester resin against the gelcoat as a blister barrier, with the rest of the laminate wetted out in polyester resin to save money. The best possible resin is epoxy, but only high-end boatbuilders use it because of the cost and the specialized skills needed to work with it. These days you are likely to find a kit builder with more time on his hands than he’d like, so you may be able to specify options that will take more weight out of the hull, such as foam-cored stringers and bulkheads or vacuum-bagged hull coring. If you want maximum efficiency, there’s just no substitute for reducing weight, although it costs more to build a lighter boat. If you have a lighter hull built, make sure the decks and superstructure are lighter as well. You can actually make matters worse by making the hull lightweight below the waterline and then building a heavy fiberglass-encapsulated plywood deck, deckhouse and flybridge. This will drive the center of gravity up and create a less stable boat with a longer roll period. Remember, the center of gravity moves toward a weight addition and away from a weight subtraction. Besides keeping the ocean out of the boat, the hull gives you a ready-made foundation for the engine, systems, decks and superstructure. Building the forward deck, trunk cabin and side decks, or washboards, takes so much time and skill to do well that customers usually order a single-piece deck/house part with the hull. 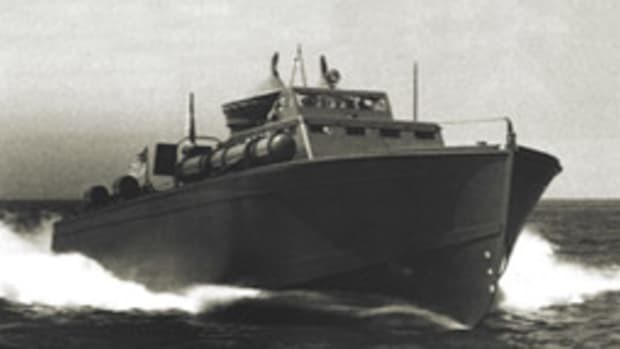 This is the second-largest part, and, depending on the builder’s approach, it usually includes the forward deck and trunk cabin, the deckhouse top, the windshield and sides, and the washrails around the cockpit. 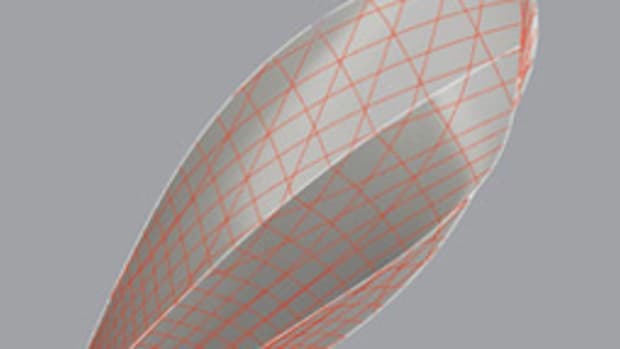 There are limitations to what can be pulled out of a female mold. For example, you can’t include both the cabin top and the deck below, so the pilothouse (or saloon) deck and the cockpit deck are usually stick-built on site with plywood, which is sometimes encapsulated in fiberglass. However, many production boats are built with the cockpit deck as part of the forward deck and gunwale, and the deckhouse front, sides and top are separate parts. So now we have the hull, including stringers and bulkheads to hold its shape, and the deck/superstructure — two big parts that stretch from bow to stern and comprise much of the boat. You can order the kit boat with the engine beds, which are just the hull stringers in the engine room, only with wood instead of foam coring where the stringers serve as the beds. Having the engine installed, if you can afford it, is the best approach for many backyard builders because proper alignment is as difficult as it is essential, taking a higher level of skill, say, than installing the fuel tank or the cockpit deck, although the intelligent and patient amateur certainly can do it. If you want to have the builder kick the ball a little farther down the street, have him install all of the running gear. This includes the engine, the propeller shaft with shaft seal and bearings, the propeller, and the rudder with steering gear. He also would be glad to install the fuel tank, wiring and plumbing, as well as a generator. Once all of the systems are in place, the cockpit deck and deck hatches can be added. The builder also will rough out the cabin for you, which means the cabin sole will be installed, along with a head enclosure and maybe a dinette and galley. If you have the builder put in the sole and bulkheads, or partitions for the furniture, you’ll have square surfaces to work from. If you’ve seen the inside of a bare Maine-style hull you’ll know there isn’t a straight edge or level surface anywhere, and that can be daunting for a carpenter who is used to working on a squared-up house. This is a good time to point out a necessity: Once you’ve moved the unfinished boat into position in your barn or temporary structure, level it both longitudinally and side to side. If the boat is on the blocks while you’re finishing it off and it has a 1-degree list to port, the cabin will have a 1-degree list to starboard when the boat is in the water. 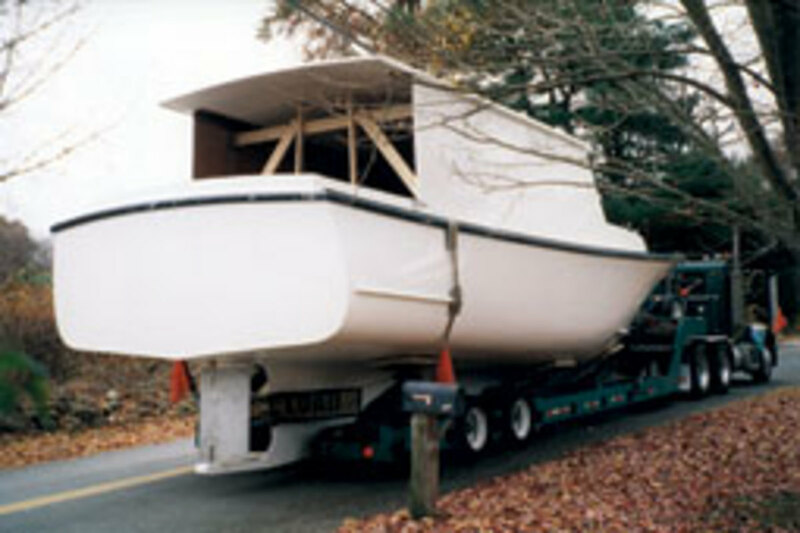 Atlantic Boat Co. (www.atlanticboat.com) in Brooklin, Maine, was formed when Duffy and Duffy Custom Yacht and Flye Point Corp. merged in 1995. It’s one of the better-known kit-boat purveyors. Atlantic offers all of its Spencer Lincoln-designed semidisplacement hulls from 26 to 48 feet as kits. To give you an idea where the man-hours go when building a boat, the kit takes Atlantic a couple of weeks to build. 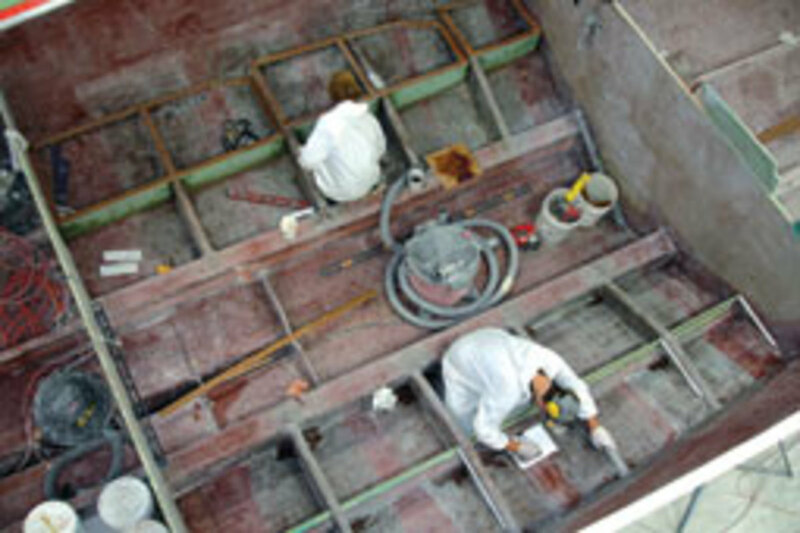 They use female molds to lay up the fiberglass parts and tabbing-in the bulkheads and stringers, for which the builder has precut templates. It doesn’t take long, which is why the kit’s basic parts are so inexpensive. The precut templates make short work of producing the basic structure. 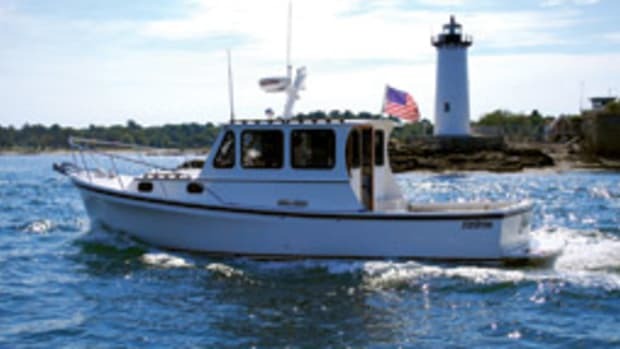 The thousands of hours it takes to build a boat are consumed when you install the propulsion, mechanical, fuel and electrical systems, and the cockpit and pilothouse decks. Cutting openings and installing the windows, hatches and portlights; finishing off the cabin and pilothouse; and sanding, prepping and painting the bottom take lots of time. Atlantic’s website says it typically requires six to 18 months to complete a kit boat. Of course, how long the project actually takes depends on how many hours a month you can put in. Other factors that determine how long a project will take include whether you know what you’re doing, if you have the right tools, whether you have adequate shelter and heat to work year-round, the size of the boat and the level of finish. 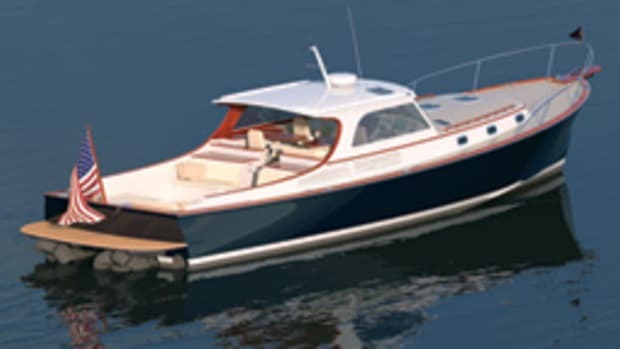 Atlantic’s Duffy 35 as a kit will run you $29,400 for the bare solid-glass hull. A vinylester skin coat is $700 and the superstructure, which includes a molded cruiser top and trunk cabin, is $19,700. For many amateurs, finishing her off to a “charterboat” finish is a reasonable goal the first time around. 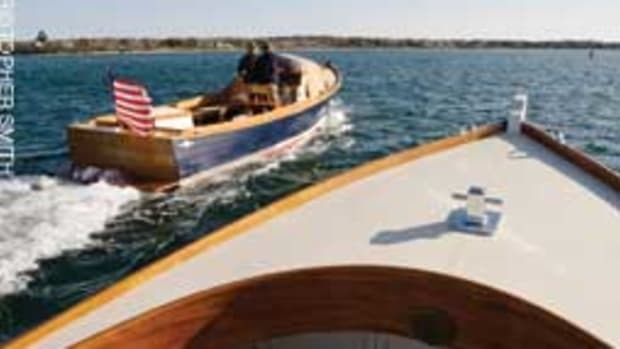 Covering the raw fiberglass with padded upholstery and building the furniture with laminate veneers takes a fraction of the time of building the boat to a Bristol-yacht standard with fine cherry or teak woodworking. 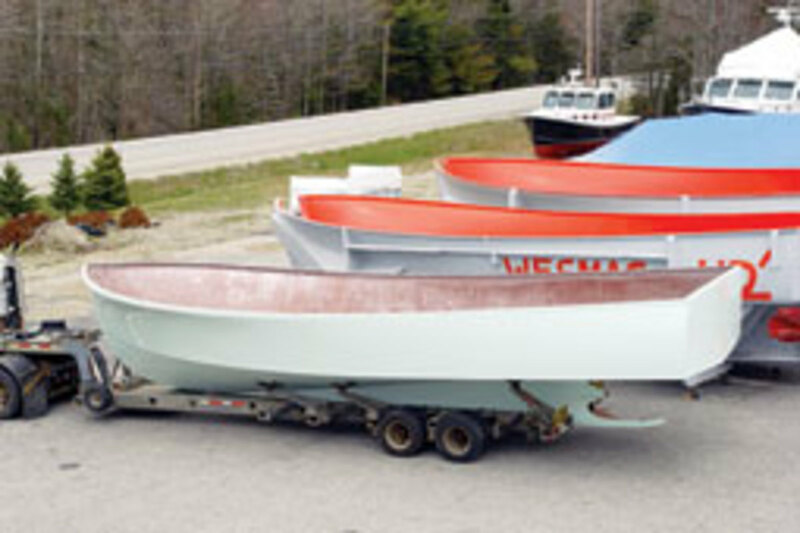 SW Boatworks (www.swboatworks.com), in Lamoine, Maine — that’s 145 miles up the coast from Portland, so get up and start driving early — builds the Calvin Beal line of boats from 34 to 50 feet, along with the Young Brothers line of Ernest Libby designs from 30 to 46 feet. All of these boats are offered as kits. The 38 Calvin Beal solid hull with a white gelcoat goes for $29,000. A colored hull is $600 extra, and a vinylester skin coat is $1,500. You can get vacuum-bagged, foam-cored bulkheads for $1,700, which saves weight. After all, why would you want to burn more diesel hauling around a plywood bulkhead? The top part (forward deck, house and cockpit washrails) is $14,000. A 3-foot extension costs an extra $2,000. The Calvin Beal 38 is 2 or 3 feet too wide for me from a seakeeping and efficiency perspective — a 15-foot beam on a 38-footer. SW Boatworks also offers the Young Brothers 38, which has a more moderate 12-foot, 8-inch beam — just about perfect from an efficiency and comfort perspective, although it will carry a lot fewer lobster traps than the Beal hull. The company’s 36-foot kit costs $24,000 for the hull and $12,000 for the deck, with comparable upgrade pricing for the 38 options listed above. This means you can get into a basic 36-foot shell for $36,000, a great price for what you get. I’d also go for the foam core to reduce weight and the vinylester skin coat as an insurance policy against blistering. There are other kit builders in Maine and elsewhere. Just e-mail me if I’ve left your line off the list and I’ll try to mention you in a future column. Although basic tool-handling skills are a prerequisite to starting a boatbuilding project, you can learn on the fly to, say, install the mechanical and electrical systems. Nigel Calder’s “Boatowner’s Mechanical and Electrical Manual” is written as a troubleshooting guide, but after carefully studying the text it’s hard to avoid learning how electrical and mechanical systems are supposed to be designed and installed in the first place. Dave Gerr’s “Boat Mechanical Systems Handbook” is another excellent resource if you’re looking for more light reading on the subject. 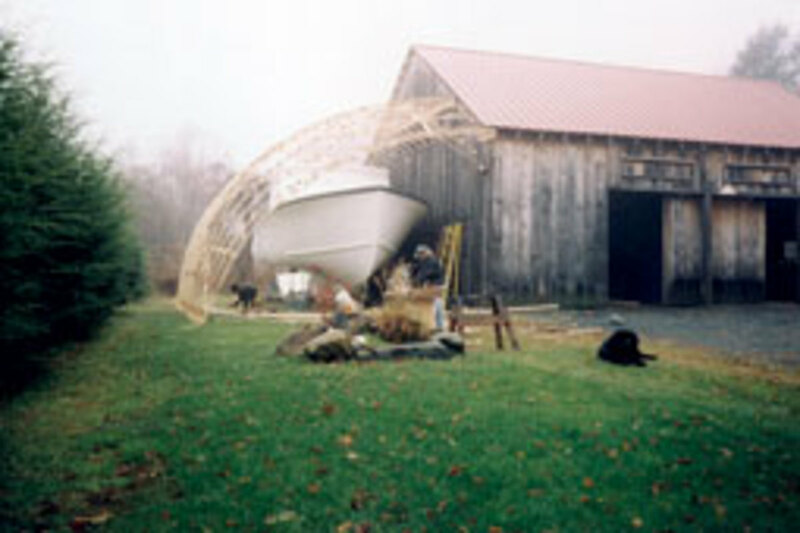 There are books on fiberglass boatbuilding available on Amazon, including Ken Hankinson’s “Fiberglass Boatbuilding for Amateurs,” a copy of which I’ve owned for 25 years. My own book, “Sorensen’s Guide to Powerboats,” includes a chapter titled “Fiberglass Construction,” which provides an overview of the construction methods, fiberglass reinforcements, and resins and coring materials commonly used today. Of course, if you have the budget, another approach is to buy the bare hull and deck and have someone else finish it off. Maybe you know someone who lives close by who has a good reputation for finishing off hulls, and you’ll be able to monitor the progress. Just as important, you also want to be able to make changes as things start to come together. Word-of-mouth recommendations are the best, and if you like the person and can establish a good working relationship, this is a good way to go. Finishing off a kit boat is not for the faint of heart. Nate Hopkins at Atlantic says it takes as much as five years for his customers to finish one, so a kit boat is definitely not the ticket if you’re seeking instant gratification. But a kit allows you to get into the game for less money than you’d pay for a finished boat, and the process allows you to finish her off your way and at a pace that should enable you to pay cash as you go. You’ll have a great yacht when you’re done, and it’ll be paid off. You also can have everything done exactly the way you want it rather than settle for someone else’s version of the best cabin layout or cockpit. SW BoatworksPrint magazine October 2011kit boatsPowerboatsAtlantic Boat Co.